The race starts and finishes at James Chabot Provincial Park. The park (indicated on the map by the “red heart”) is located just south of the intersection at Laurier Street on 3rd Avenue and consists of large washrooms, picnic areas, and beach area. Lake Windermere Pointe Resort and many restaurants are located nearby. Transition and the race finish all take place in the two paved parking lots near the washroom facilities. (See transition map). Please refer to Pre-Race Information for more details about our timing system and other important information to ensure the smooth running of your race day. This page will be updated prior to race day to ensure any changes are available to participants. Please note that dogs are not allowed in James Chabot Provincial Park. 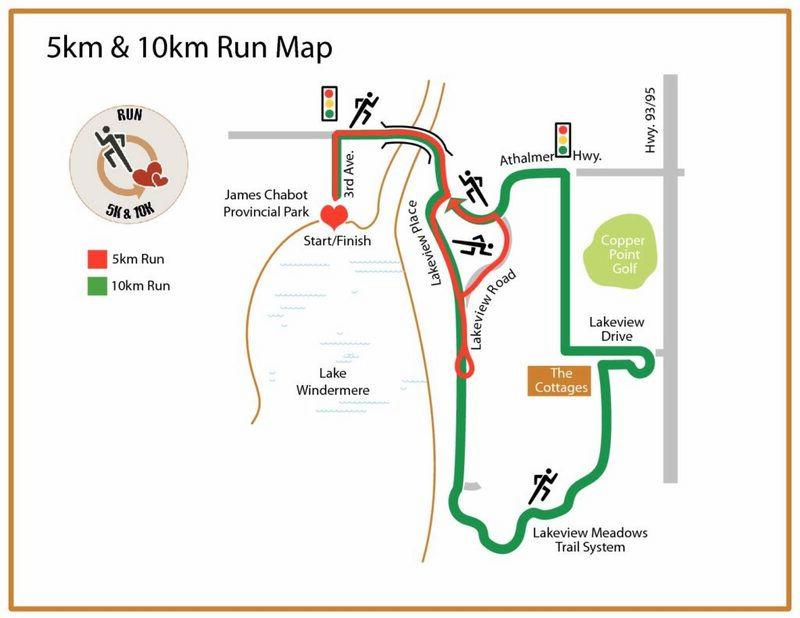 Standard Competitors: This 10 kilometer scenic loop takes runners east on Laurier Street, over the bridge (Columbia River) on to a short connecting path to Lakeview Place and continuing along Lakeview Road. Runners will pass an aid station, and later follow the scenic paved trail through Lakeview Meadows. Upon exiting this trail, runners turn right on Lakeview Drive and proceed to the turnaround and aid station before Highway 93. Runners are advised to stay left along Lakeview Drive to the controlled intersection at Lakeview Drive and Athalmer Highway. 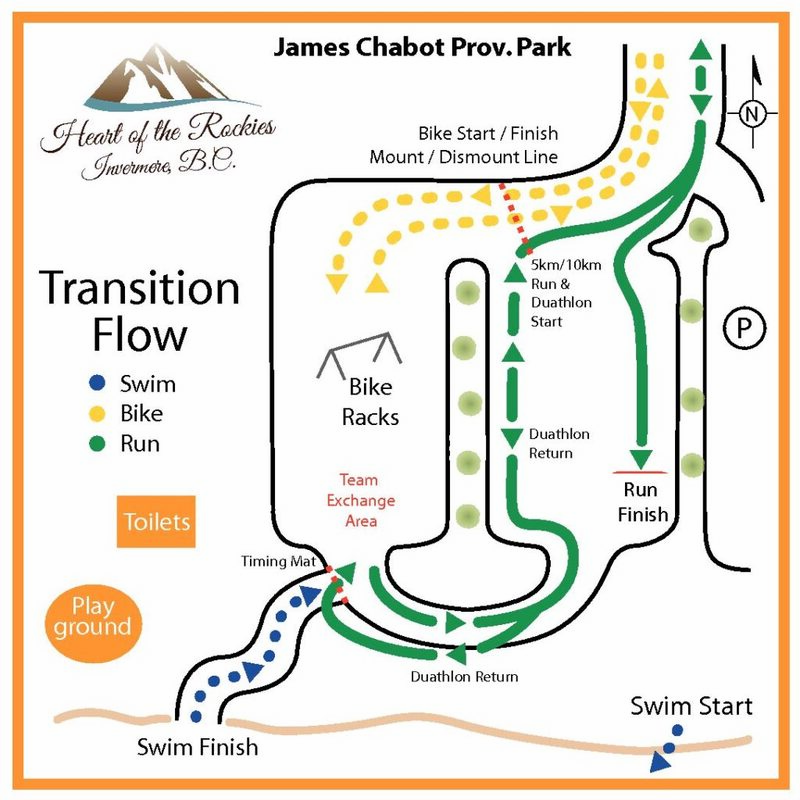 Turn left on to Athalmer Highway for the downhill over the bridge to the finish at James Chabot Provincial Park. There will be 4 aid stations on the course. Don’t forget to follow the “red hearts”. Sprint Competitors: A 5 kilometer scenic loop takes runners east on Laurier Street, over the bridge (Columbia River) on to a short connecting path to Lakeview Place, continuing south for a short distance on Lakeview Road to the turnaround and aid station (at approximately 2.5 kilometers). On the return, go right at the fork of Lakeview Place and Lakeview Road for the climb to Athalmer Highway. At the top, turn left on Athalmer Highway for the downhill over the bridge to the finish at James Chabot Provincial Park. Don’t forget to follow the “red hearts”. An out and back course – cyclists leave T1 transition area heading north on 3rd Avenue and turn left onto Laurier Street to be faced with a climb over the railroad overpass to the controlled intersection near Sobey’s. Both traffic light controlled intersections (Laurier/3rd Avenue & 4th Street/7th Avenue) will be manned by professional flaggers. Turn right on to 4th Street, to pass Sobey’s, then turn left on to 10th Avenue (at the T intersection) and continue along 10th Avenue to 13 Street. Turn right on to 13 Street where a short climb takes you to 13th Avenue (Westside Road). Turn left on to 13th Avenue/Westside Road. From here to the turnaround point (Standard @ 20 km / Sprint @ 10 km), cyclists will have clear sailing on an undulating, low traffic, scenic road. Caution is advised on the return due to tight turns and a rapid descent back to the transition area. 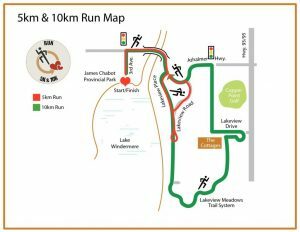 A 5 kilometer scenic loop takes runners east on Laurier Street, over the bridge (Columbia River) on to a short connecting path to Lakeview Place, continuing south for a short distance on Lakeview Road to the turnaround and aid station (at approximately 2.5 kilometers). On the return, go right at the fork of Lakeview Place and Lakeview Road for the climb to Athalmer Highway. At the top, turn left on Athalmer Highway for the downhill over the bridge to the finish at James Chabot Provincial Park. Don’t forget to follow the “red hearts”.